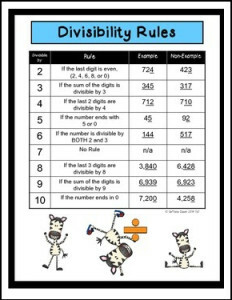 This cute one-page divisibility rules poster will come in handy during math class for students working on factoring, simplifying fractions, and more! A small version of the poster is included for students to use in their Interactive Student Notebooks (ISN) or binders so that they always have it handy. Finally, a short worksheet for individual students or partners is included so that students can work on the newly learned rules to help commit them to memory. I hope you find this free download helpful and of high quality. If so, please give me some happy feedback and follow me (Caffeine Queen) and my store! I am hoping to grow much larger very soon! Thanks so much and check back for more products!